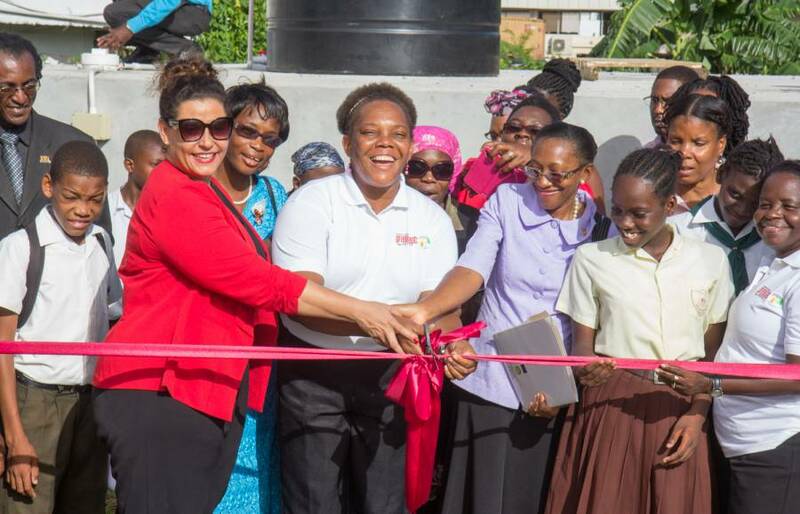 The Grenada School for Special Education is the recipient of a 20,000 gallon concrete tank, a drip irrigation system and solar pump. In a ribbon cutting ceremony held on 22 June 2016, the project jointly implemented by the Ministry of Agriculture, Lands, Forestry, Fisheries and the Environment in collaboration with UNDP–ICCAS will facilitate gardening and agricultural production during the dry season, and provide for the conservation of water during the rainy season to be utilized by the school for domestic and gardening purposes as an adaptation measure to the effects of climate change. This project was selected due to Grand Anse being one of the driest areas during the dry season, which causes severe water shortage episodes leading to a seizure of gardening activities in this area. This system will reduce the pressure and reliance on existing water storage systems and enhance water resource management through rain water harvesting. The school will benefit from increased cultivation of the 500 square feet of agricultural land which the 4H club uses to grow produce used in the school feeding program and will introduce climate smart farming techniques. The Community Climate Change Adaptation Fund awarded the Grenada School for Special Education EC$118,941 in a cheque presentation ceremony held by the UNDP–ICCAS project in November of 2015 to execute this project, and is pleased with the resulting milestone the school has achieved. The Integrated Climate Change Adaptation Strategies (ICCAS) is funded by the German Ministry for the Environment, Building, Nature Conservation and Nuclear Safety (BMUB) as part of its International Climate Initiative (IKI), and implemented jointly by the Environment Division of the Ministry of Agriculture, Lands, Forestry, Fisheries and the Environment, GIZ and UNDP.